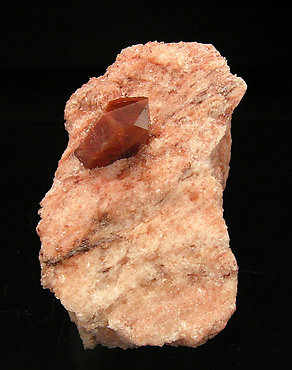 Doubly terminated red Quartz on its classic red Gypsum matrix. Very uncommon on matrix this is a very representative sample. 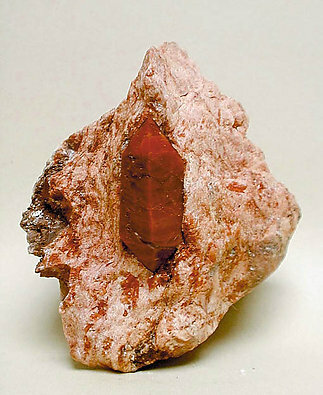 Deep red-colored sharp crystal with very well defined faces and edges on a reddish Gypsum matrix. The sample is from a very recent find, February 2010, in a zone well known for the quality of its “Jacintos”. 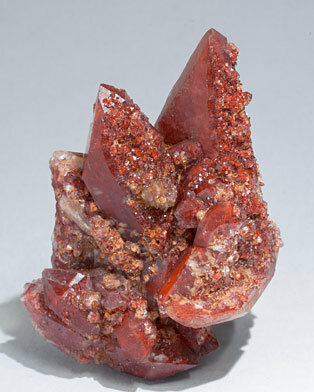 Sharp, doubly terminated deep red-colored crystal on a reddish Gypsum matrix. The sample is from a very recent find, February 2010, in a zone well known for the quality of its “Jacintos”. A novelty at Tucson 2015. 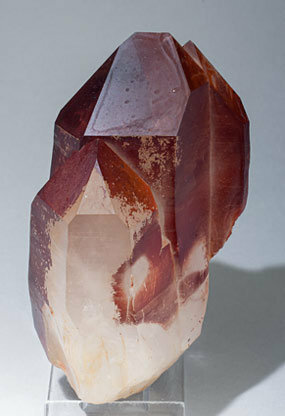 Quite different from other Quartz samples previously collected at the same area by its morphology, with a wide development of one of the pyramidal faces and by the Hematite distribution, both as coatings and as inclusions that occupy most of the Quartz crystal’s interior and by a second generation of small crystals. A novelty at Tucson 2015. 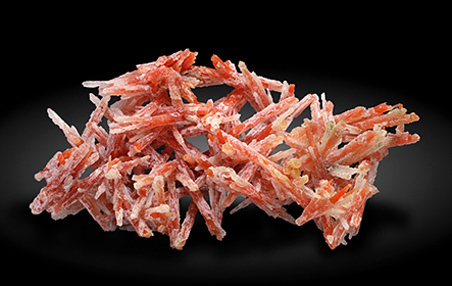 Quite different from other Quartz samples previously collected at the same area by its morphology, forming a parallel growth of very thick crystals and by the Hematite, both as fine coatings and as inclusions that occupy part of the Quartz crystal’s interior. A novelty at Tucson 2015. 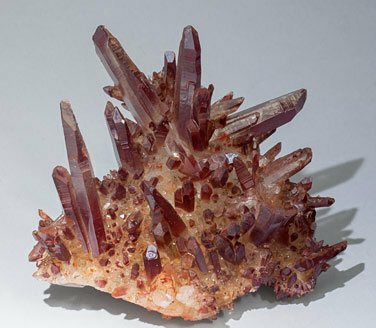 Quite different from other Quartz samples previously collected at the same area by its morphology, with a very wide growth of one of the pyramidal and two parallel prismatic faces, and by the Hematite, both as fine coatings and as inclusions that occupy part of the Quartz crystal’s interior. 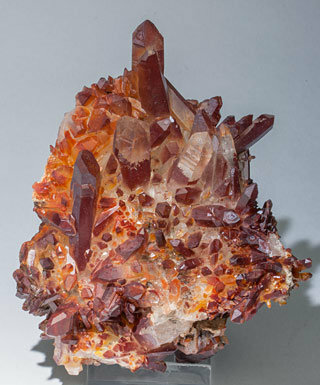 Between 1997 and 1998 there appeared in the 2nd Sovietskii Mine from Dalnegorsk specimens of red Quartz with a very different habit from the usual, elongated, crisscrossed, and forming very "sculptural" groups. Although at that time it was thought that they would continue to come out, as soon as they appeared they disappeared and they have not been seen again. 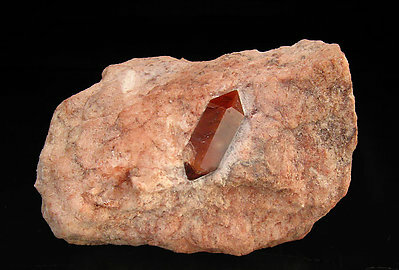 From that extraordinary time we have rescued this elegant specimen in which the red Quartz is partially covered with white Quartz. Well, I feel that the photo says everything. Maybe I should just add that the matrix is not Quartz but Sphalerite with some well formed crystals. 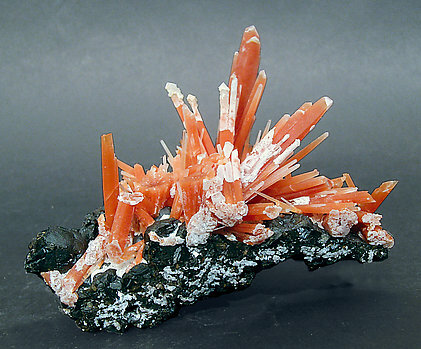 As is well known, the small white areas on the red crystals are a second generation of white Quartz.